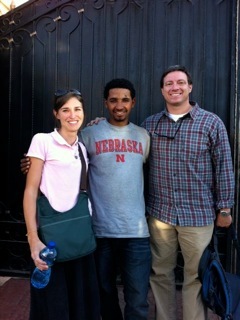 A day in Ethiopia is filled with so many emotions, thoughts, and feelings! The wait for her is over, but really everything is just beginning. I have read and researched and prayed and sought wisdom and counsel from those who have gone before me. And, it is so different to actually walk through it. 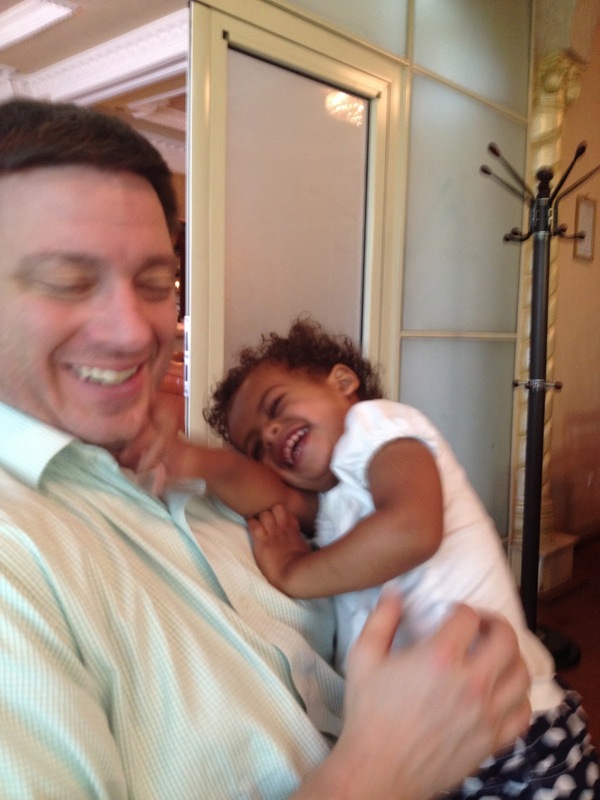 There are unbelievable moments of deep deep joy that she is with us. She is fun and mischievous and brilliant! She watches everything we do! 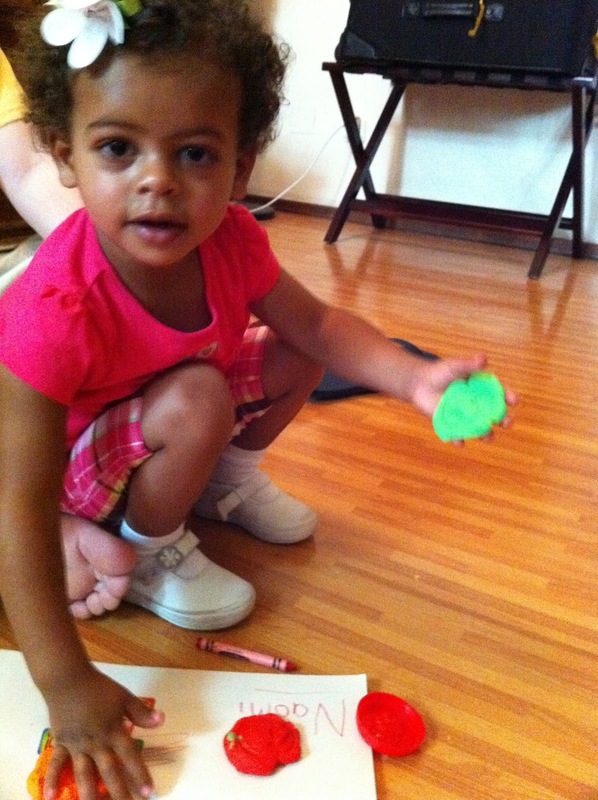 She loves playing with water bottles, play-dough, stickers, and coloring books. She is a typical toddler in those ways...yet...she has such deep pain. Every day gets better, and we are asking God to heal that pain. As a mom, it is HARD to not want that healing instantaneously...to want her to run to us and trust us and be comfortable and so excited just because she has a family now! But, when I think about it, I know that that wouldn't be right...and I wouldnt' even want it, because in the end, I know she will be healthier to really walk through these hard moments. If we skipped over them, she would be missing a huge piece of healing that God is bringing to her heart. Today that hard moment came after a meltdown and Naomi kept saying "Asa! Asa! Asa!" We have wondered all week what that meant, as she always says it through tears. We have asked people and no one understood. But today, a lady said, "Oh, she is saying, 'There! There! I want to go there!'" Break. my. heart. Even as I type this, my stomach is in my throat. This whole time, when she is sad, she is telling us she wants to go "There!" ...back to Hannah's Hope. Where she knows people. Where people know her. Where people talk like she does. Where they know what food she likes. Where they know how she likes to sleep. Where they understand her. In those hard moments, I am reminded that this is one reason why God never intended to grow our families in this way. It is because of a fallen, broken world that adoption is even needed or possible. So, in this fallen, broken world, there is deep pain. So, in the painful times, I will seek and trust God. He has led us on this journey, and he is not leaving us now. He is Emmanuel. God WITH us. He is all-knowing and sovereign. So, I will trust him even when my love is rejected. I am learning that there is hurt behind all of that. And, it is making me cling to God's Word in a new, different way. I hunger for more. I am dependent on Him in all of the moments, and thankful that He is strength in my weakness. Let me tell you...I LOVE that little girl. It is amazing. I eat up every minute that she playfully cuts her eyes at me and grins the biggest grin. 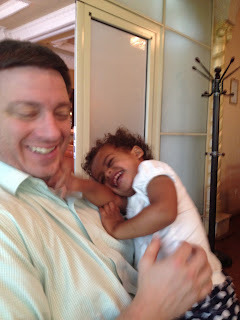 And...she is SUCH a Daddy's girl! He gets big hugs out of the blue. I love seeing her learn and play. I love that she likes things JUST the way she likes them. I love that she likes to sing songs. I LOVE her little sweet voice. It is SO CUTE! I love that God led us to her and is now bringing her to her forever home. There is so much deep joy in her, and I can't wait to see more of it. I can't wait to learn everything about her. She is SUCH a gift to me! THE BEST BIRTHDAY PRESENT EVER!!!!!!! Meet our daughter, Naomi Renee Crenshaw! We have cleared Embassy, so we can finally show you who you have been praying for!! :) And, wouldn't you know that God would line it up to have our Embassy appointment on my birthday!!! She is amazing, fun, beautiful, funny, scared, grieving, and delightful! There are so many emotions wrapped up in the last two days! That picture above was from yesterday, but I will add some other ones from our first trip below! More updates later....I am off to bed!!!!!!! Thank you, Lord, for this precious girl. We wanted to write you a letter to tell you how much we appreciate you and the impact you have had on our lives (especially the last few years!). We also wanted to share some struggles that we will likely incur when we bring our daughter home in the next few weeks to months. Lastly, we wanted to ask for your support in a couple of areas in this transition for our family. You guys have blessed us beyond anything we could ever imagine in this journey of bringing our daughter home!!! It has been almost 3 years since we started taking steps towards bringing her home, and you guys have been there every single step of the way. You have prayed for us, encouraged us, given of your own finances, served us, loved us, written sweet notes, and held us up when times were hard! THANK YOU!!! SO MUCH! I have said this before, but our daughter has no idea how loved she is. She has and will continue to experience the love of Christ through you and I am sure one day she will look back amazed at what God did in her life using people that didn’t even know her yet! We are SO CLOSE to bringing her HOME..FOREVER! We are so thankful to the Lord for His faithfulness in our lives through all of this. 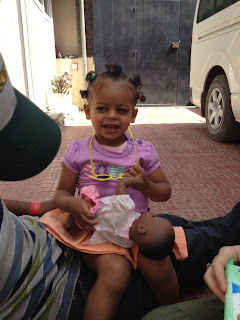 As we get closer and closer to our final trip to Ethiopia, we are thinking more and more (and praying more and more!) for her little heart. She has gone through so much in her not-even-three years of life. She has lost family members. She has seen the effects of sickness and poverty in a way that most of us never will. She left her home where she was born and her community that knew her and loved her and helped care for her. She went to an orphanage where she didn’t know anyone, and didn’t really have anyone care for her. Shortly after, she again was moved to a place where she didn’t know anyone. 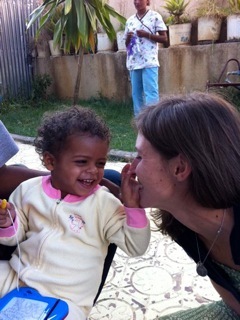 She came to our transition home (Hannah’s Hope), where we learned about her. 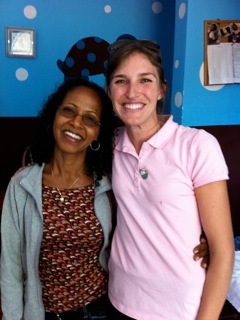 In this amazing place, though, she is very loved with the most incredibly loving staff through our agency!!! She has a place of belonging. She is played with, sang to, provided for, fed, clothed, and bathed. She LOVES it! She loves all of her “special mothers,” she loves her friends, she loves the babies that she helps “take care of,” and she loves the people that she sees all the time. She feels comfortable and secure. And now we enter in to another difficult part of this journey…she will have to leave all that she knows and loves. Even though we know that God has beautiful things in store for her life, she does not know and understand this right now. She will feel hurt, abandoned by the people she loves, and insecure in who we are to her. And this time, she will not know the language we are speaking, not many people will look like her, the food does not taste the same, the culture looks completely different, and there will be nothing in her world that is safe and secure to her. The process of learning to trust us, to trust that we will always be there to care for her is called attachment. Normally, attachment between a parent and biological child happens as a baby has a need, communicates that need, and then mommy or daddy meets the need. This repeats over and over to create trust within the child for that parent. Children who come home through adoption have experienced interruptions in this typical attachment process. The loss of a biological mother at an early age is a major trauma on their little hearts. The many changes of caregivers also damages and confuses their hearts. This is where we need your help again. We want that attachment to us to be as strong and healthy as possible for her overall emotional, physical, and spiritual health in the future. Because of this, she needs to learn how to be a part of a family and how to trust us as her parents for her needs. As our amazing community that loves our family, we want to tell you that we will spend a period of time (probably 2-3 months or so) where we will pretty much stay close to home and focus on this emotional need of our daughter, without extra visitors in our home. We know you want to meet her and love on her, and we really want that too, but we want her to have a healthy attachment to us first. We need to be the only ones who meet her needs for food, basic physical needs, as well as emotional needs (cuddling, hugging, holding, etc). It would be a huge help to us when we start venturing out if you point her to us when she needs something. Waving, blowing kisses or high fives are perfectly appropriate and welcomed! Please understand that we want nothing more than to have our little girl hugged, cuddled and cherished by ALL of you (she's totally irresistible and huggable). But until she has a firm understanding of family and primary attachments, we would be so grateful if you direct her to us when she is seeking out food, affection, or comfort. 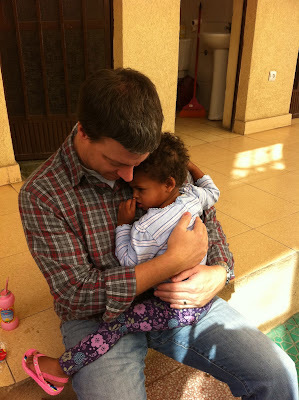 Over time, as she learns that we are her parents, it will become okay to treat her just like our other children. You could also help our family by getting the other three kiddos out of the house! They will be going stir crazy and would love a special time at the park/library/etc. with their loved ones! I am sure Mama will be going stir-crazy, too, so any texts, emails, or phone calls to encourage her is greatly appreciated! She will need some adult conversation! J We covet your prayers for wisdom in every moment with every need, healing for our sweet daughter’s heart, abounding love and compassion, and more patience than we knew we had for each of us! We are asking and trusting God for these things! Thank you so much for really walking this journey with us. You have loved our family so well. We know that you will help us make the healthiest transition for our little girl! Please let us know if you have any questions or want to talk about any of this! We love y’all SO VERY MUCH!!! Just wanted to update the process from here on until we bring home our little girl...FOREVER! :) Cannot wait!!! After we got submitted at the end of January, we heard from the Embassy about what they still needed to clear our file. We will give them that last little piece (which is an interview) on February 27. We are hoping that on that day, they will clear us to get her visa and bring her home. When that happens, they will give us a date to go back to Ethiopia. That can be anywhere from 2 days later to 2 weeks later. We are SO excited to be one week away from hearing from the Embassy again...hopefully to tell us that the wait for our little girl is over. We are so ready to hear her laughter in our house (in her house!) and have her little feet running around with the other kiddos. Her siblings long to have her home. We made a paper chain to countdown the days until we hear from the Embassy. On each link, we have something that each of us wanted to pray for her as she comes home. Every night when we tear off another one, we pray for the thing that is on that chain. 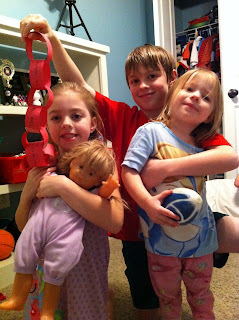 Here is a picture from tonight with our countdown chain! Please pray that everything goes smoothly and that we are cleared next week and get to go THAT WEEK to get our little girl!! I am INCREDIBLY thankful to post that we were SUBMITTED TO THE EMBASSY!!!!!!! One step closer to our little girl, and this is the LAST part of the wait!!! We are so thankful to the Lord. It was a long road! Our precious case worker called and I was very guarded when I saw her name...I thought it could be another "medical update..." they always notify us if she is on any kind of medicine, even if it is just for a cold or ear infection, etc. Anyway, she said she had good news and it was a good thing that I was pulling into my driveway b/c I wouldn't have been able to see the road through my thankful tears! She said that this part of the wait would be the hardest...I am not too sure about that! I could be VERY wrong and I will let you know, but waiting 7 weeks to get submitted has been pretty tough. I am sure that a lot of it was based off of assuming it would look like other files and we would be submitted after 2-3 weeks. Those last 4 weeks of thinking "it could be the week" made for an emotional roller coaster. Well, every child has to be cleared by the Embassy to get a VISA to come to the US. They have our file and will be reviewing it soon. This used to be a quicker process, but they are really digging deep into each case to ensure that there is not anything unethical going on. So, they will ask for different interviews and then compare that information to the information that is on our file. If it all matches up and they don't question anything, they will clear us to come and get her. They do have the right to send our file to Nairobi for more investigation. I pray that does not happen. -our file was submitted yesterday...Jan. 23. -The Embassy usually notifies us that they have received it about 2 weeks later and soon after says what interviews they will request. -The interviews have been taking place about 2 weeks after the request. -Usually at this point, families are hopping on a plane a few days after they are cleared! So, this could still be a long process...anywhere from 3-7 weeks, I am guessing?? Maybe longer if the file is sent to Nairobi. I am praying that it is closer to the 3 week mark! I am VERY thankful to be in this last step!!!!! 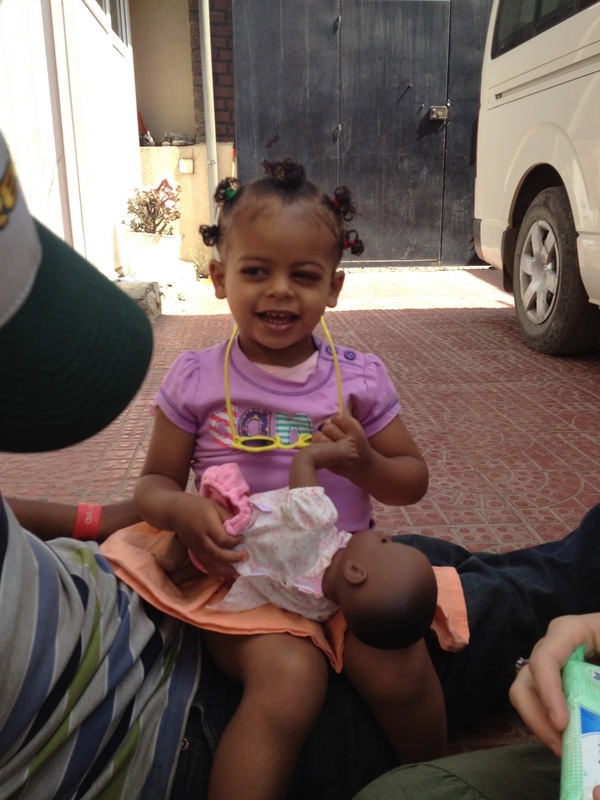 Praising God for His love and peace in the wait, and asking Him to bring her home quickly! We went out for Mexican to celebrate, of course!!! Speaking of celebrating with Mexican food, we did that last week, too...when our precious son and sweet niece got baptized!! It was very, very special!!!! Such an incredible night! The two of them were so excited to "show everyone that they were Christians!" My amazing husband baptized Austin and it was so very special. He read a letter from us that encouraged him and challenged him in his faith, asked him some questions about his faith, and baptized him. 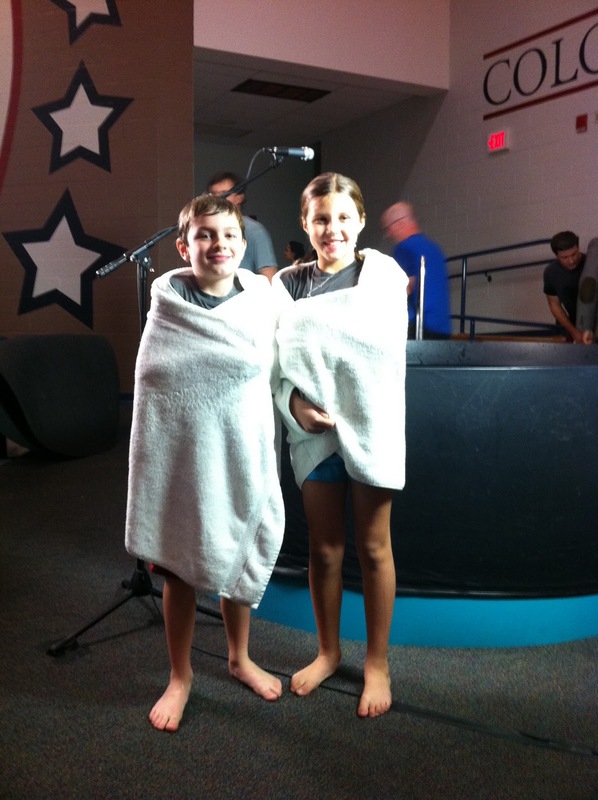 My brother also got to talk about Emily and encourage/challenge her and baptize her! Oh my goodness, it was a memorable night, and I am so thankful for how they have learned and grown and made a commitment to Jesus. I can't wait to see what God does in their lives. This has been a really sweet week. It started off pretty rough. I started this "crazy cycle" where I would get progressively more excited towards the end of the weekend because I knew that Monday was coming. Monday is the day that AGCI (our adoption agency) can submit files to the Embassy. It has been six weeks, and our file hasn't been submitted. Most are submitted after 2-3 weeks, so I thought for sure it was coming...every week. Then, Monday would come. And I wouldn't get the phone call that I wanted to get, and I was completely discouraged and defeated. I just wanted our little girl home. Last week was no different, although, we did get a phone call. Just not the one I wanted. My phone showed our case worker's name and I was SO excited!!! But, she was just calling to talk about our fingerprints. Total let down. Sweet her, she has been so compassionate and "with us" every step of the way! I think she will be almost as excited as we are when we get submitted! So, the night I talked to her I was really discouraged, wondering when we would get to bring our little girl home. It seems like so long ago that we were there, and then the highs and lows of the week were all-comsuming. I prayed. I was so tired of feeling that way. My perspective was affecting so many other people. It is so easy in this process to focus on the hard things. The pain of the fallen world and fallen system and fallen people. The wait. The emotional ups and downs and the people that you bring with you on that roller coaster. I am so thankful... God so graciously changed my perspective. I had conveniently forgotten all of the incredible things...God's faithfulness to provide for us. Him allowing us to receive a beautiful little girl into our family. A redemptive story through the pain of loss. 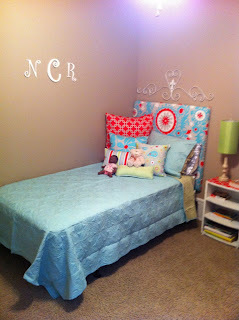 An incredibly loving transitional home for her. Food and clothes and everything that she needs right now. A bath for her every night. Sweet women who love her. Her brother and sisters here who ask about her and pray for her every day. An adoption agency who walks us through all of the questions. Resources in our community. Families who are willing to "live life" with us. Extended family and countless friends who love our little girl and have never even met her. God's Word. His Holy Spirit. 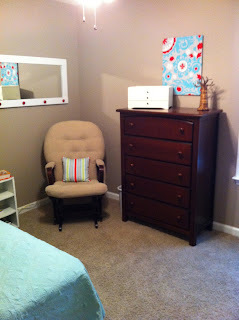 Even little things like an extra spot in a room to put growing "packing" piles in. Sweet conversations with our children already at home. A finished room waiting for a little girl to be there. I decided I didn't need to put myself on a roller coaster anymore. She is being loved so much where she is, and I am thankful for that. We are SO READY for her to be home, yes. FOR SURE! But God has shown me so much in this journey, and it surely isn't about me and my emotions. 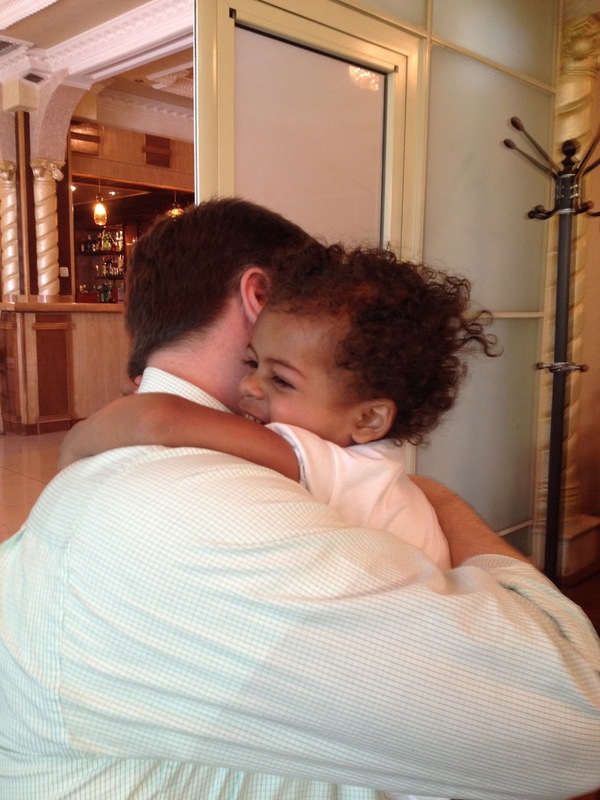 I know there will be hard days, but I don't want to forget why we started down this beautiful and hard path of adoption in the first place. We felt led by the Lord. And we continue to. He is faithful. As hard as it is, I give up all control and rest in His beautiful plan. That being said, it is 8 am in Ethiopia right now. I am guessing the Embassy is opening soon. I am hoping our agency can submit files today since they were closed yesterday. I am praying that "N's" paperwork is all in order and will be submitted. And, I am really really thankful for the peace that God has given me. I haven't really had the heart to write this post, but I figured that I need to document all that I can, so here goes! We got to go see our little girl for a couple of hours in the morning. That day she loved those little things that you scratch off the black part and there is color underneath...you know what I am talking about? I have no idea what they are called! She also liked blocks and coloring. 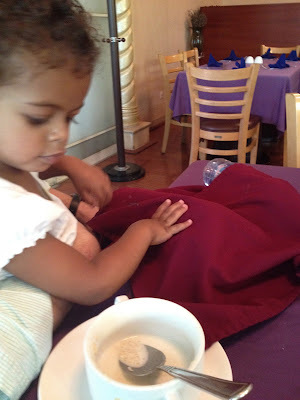 She started getting protective over the things that we brought for her (and all of the other kids!) to play with. Even if she didn't want to play with them, she didn't want other kids having them! We made matching bracelets which someone recommended to help make connections that she is a part of our family. Brian and I both had one on, and we showed her that we had ones that were just alike. We put hers on her and showed her that they were all the same. We kept saying "Mommy's and Daddy's and ____(N)____'s," to try to make the connection. She liked them. I still have mine on, and the other kiddos will have one, too, when she comes home. She had a GREAT time painting fingernails, too! She loves the doll that we brought for her, and she even painted the doll's nails! Ha! Olivia keeps saying, "Mom, did "N" REALLY paint these nails in Ethiopia!?!" We made a photo album to leave with her with all of our pictures in it. It was really neat, because it had 5 different buttons you could push (one for each page), so we each got to leave her a "message" that corresponded to our picture. One of the pictures I put in there had a picture of our whole family, and we were holding a big picture of her. We wanted her to connect that she is a part of our family and that the kids in the album are her brother and sisters. When someone came in to tell us that it was time to go, she was not happy at the moment (from something else that happened, but I can't remember! ), so she didn't get into telling us good-bye. It was sad for me, and the bus ride home with all the other families (who had also just said good-bye to their little ones) was silent. I wish we had more time. 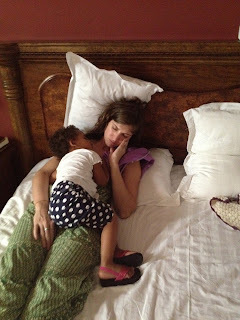 But, I was glad that she wasn't torn up about saying good-bye to us. She is SO happy there and I am VERY thankful she is so connected to the special mommies and so very loved where she is. I had envisioned it being HORRIBLE to leave her...that she would be devastated...and it just was not like that. I am so glad because the thing that I was most torn up about is all of the pain and loss she has suffered in her little life...I didn't know how she would know that we are COMING BACK. I just thought that she would think we were leaving her, too. So, it was sad for me, but I am so glad that it wasn't sad for her. We just left like we did every other day we were there. The flight home...I felt like my heart was literally ripped in two and part of it was in the US with the other kids and part of it was in Ethiopia with "N." It was terrible. Still is. We miss her so much. Trusting in God's timing. Trusting in His provision. Trusting that He is taking care of her and us. Begging Him to be supernaturally knitting her heart to ours in our time apart. I can't wait to be back on a plane headed to bring her to her forever home. This is "T." I NEVER learned how to pronounce her name correctly, so she said I could just call her "T." She is wonderful! She was the expert on our little girl's file/history, and she was SO HELPFUL!!! This is Was. Everyone LOVES Was! He is our driver, speaks English really well, knows a lot about everything going on, and he is all the kids FAVORITE playmate!! And...this is the amazing and famous Almaz. OHHH, Almaz!!!!! I heard incredible things about her and couldn't wait to meet her and she truly is so amazing. She loves these children and advocates for them SO well! She is from Ethiopia, but was in the states for many years and felt the Lord leading her back to Ethiopia. She followed Him, and He has done amazing things through her! I am so thankful for this woman! I am married to my incredible husband, Brian for 8 years now. We have 3 awesome kiddos that we get to enjoy here on earth, and 3 awesome babies we will meet one day in heaven. 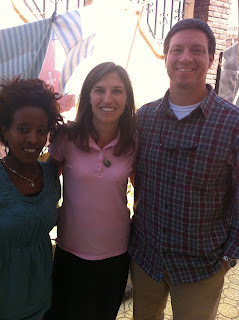 We are anxiously awaiting our newest addition...a little one from Ethiopia! I am passionate about many things, and right now focused in on our marriage, parenting, adoption, and orphan care in general.